Since we published this comparison Oral-B has launched a new line of brushes, including the Oral-B Smart 6 6000, which is an upgrade to the brushes written about below. We would recommend checking that out instead of these two brushes – you can read our review here. The concept and thought process behind the Pro 6500 is right and as a fan of all things black, initially it has that wow factor, but the premium price tag does not justify the exclusivity of the additional tongue cleaning mode, so the Pro 6000 is our winning choice. The Pro 6500 is finished in a premium Black colour compared to the white of the 6000. Detailed Comparison: What’s the difference between the Oral-B Pro 6000 and Pro 6500? Both of the brushes on show here are part of the Smart Series range from Oral-B. 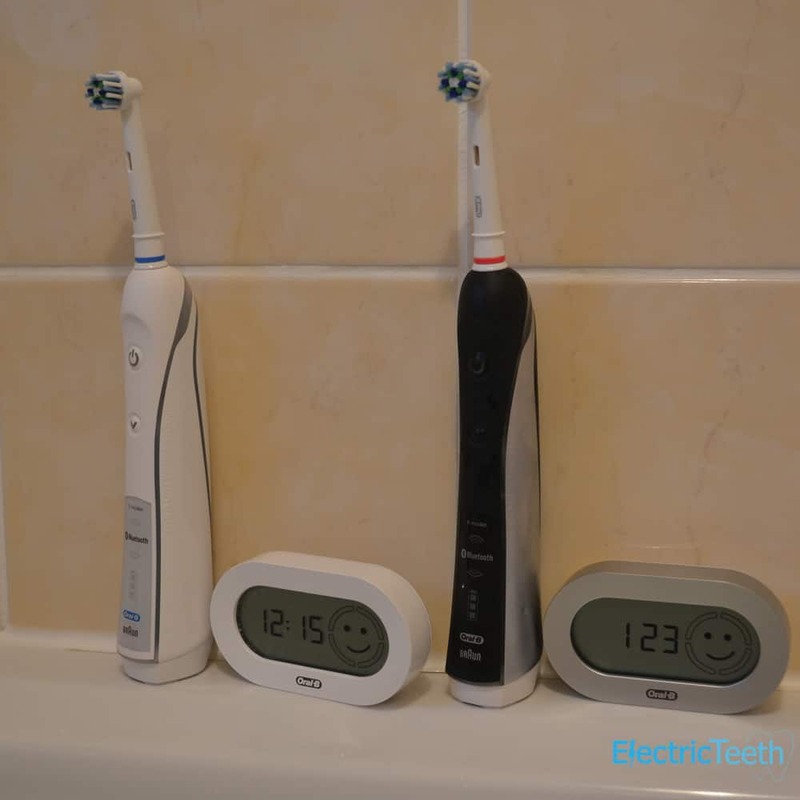 Essentially these are the flagship, the all singing, all dancing can’t get better than this electric toothbrush and to be fair features and clean wise both of these have it nailed. With the right cleaning techniques and selecting the appropriate brush heads, even those with more advanced oral health care needs will feel and notice the difference and to have the praise of their dentist. What sets these two brushes apart are three key things. So looking at point 1 in more detail. Sit these two brushes side by side like we have in the images and whilst physical size and weight are the same, the colour schemes are not. Gone are the clinical dentist whites and replaced with classy black and silvers, including the Smart Wireless Guide. First impressions are good, but then spend a little while longer and for us the ‘wow’ factor is somewhat quashed. The silver and black body, with the blue illumination from the built in LED’s look lovely until you come to the brush head which is white. The whole shaft is gloss white, the same as any other brush head in the Pro or TriZone series. Ok so they are interchangeable heads, but why could Oral-B not produce some black coloured brush heads (plastic body, not bristles) to match. Had the design theme continued it would have looked better and more complete but to us (we are no style gurus) it just looks, well, incomplete. Philips manage to produce different colour brush heads for their range of brushes available in different colours. If style really is important, our recommendation would be go for the all white Pro 6000 or consider the Philips range. Even with the Wireless Smart Guide, the front and sides are silver and the removable back cover…white. Ok it is on the back, but why?! Point 2, a cleaning mode would normally take priority; but here, the additional cleaning mode is a ‘Tongue Cleaner’ which whilst more important than one may initially think does not make the 6500 a must have over the 6000. Use the Sensitive (Massage) mode and you have virtually the same number of oscillations and pulsations as the tongue cleaner. What you do not have is the programme that sets the brush to clean for just 20 seconds on this mode. Then there is point 3, the price. Whilst not a guarantee, Oral-B’s recommended retail price (RRP) tends to be over inflated and you do not need to spend too long on the high street or online to find the brush at 40-50% less than the RRP. Thus as we write this, the £229.99 Pro 6000 is available for £105*. The Pro 6500 is a slightly different story. It has an RRP of £249.99 but is available at the time of writing through only one company in the UK. This exclusivity in colour and availability allows it to hold its price a bit better. That said, offers at particular times of the year including Christmas and other sales periods often see the price tumble to £124.99*, which is more acceptable. And that is it in as far as differences go. However, you may not have read in detail about either brush, so please allow us to give you a little more information. Both brushes have been reviewed independently and in detail at different times. Each brush has a comprehensive written review, which includes hands on video, links and frequently asked questions. Find these on the links below. For the sake of clarity, let us cover some of the similarities between these brushes. Both measures in at 24 x 3 x 4.5cm and weigh 168g including the brush head. Both will last for up to 10 days or 40-50 minutes of brushing time based on one user. Both have a Daily Clean, Gum Care, Sensitive, Whitening and Deep Clean mode complete with built in timer. Both come with a box contents that includes a charging stand, a compartment for storing up to 4 brush heads, a Wireless Smart Guide, a travel case and 4 brush heads. The 4 brush heads included are a CrossAction, FlossAction, 3D White and Sensitive head. These heads are interchangeable and work best with specific cleaning modes, although all heads can be used on any cleaning mode if you choose. Find out more about the different brush heads here. Both brushes have Bluetooth connectivity and via an app can connect to a smartphone or tablet to record daily usage patterns. Each brush also benefits from a visible pressure sensor. Here is a little more explanation into some of those similarities above. Dentists recommend a 2 minute cleaning cycle twice a day. This is made up by breaking your mouth into 4 quadrants and spending 30 seconds on each. Both the Pro 6000 and 6500 have built in timers to assist with the 2 minute clean along with a quad pacer that alerts you to the 30 second intervals, so you know when to change quadrant. Certain cleaning modes (Whitening) actually last for longer and the brush handles this. With these premium models, unlike the cheaper Pro 2000, 3000, 4000 & 5000 that also have pressure sensors, at the 30 second quadrant intervals, the pressure sensors flashes green and then again at the end of the cleaning cycle. This is a smart and neat touch. It will also light up red when too much pressure is detected. Either brush comes with a charging stand that clips into the brush head storage compartment to make for neat storage. The brush can be left on charge all the time if desired, but the 10 day battery life does not require it to be left on charge. If you do, just make sure you deplete the battery every 6 months to ensure long term reliability. The travel case included in the box, allows for the storage of the brush handle and up to 2 heads when travelling. The SmartGuide, if you are not aware is an oval shaped object, much the size of a portable travel clock and comes supplied with batteries and an adhesive pad so it can be mounted on a wall if required. It acts as a clock showing the time, Pro 6000/6500 brush is activated, the display shows a timer, a star rating, an animated face that gives feedback on your performance, a graphic to identify the cleaning mode you are on and a quadrant indicator. Whether you are 20 or 60 this guide can be very useful. It can encourage as well as be a motivator for cleaning your teeth properly. The removable batteries last about 3 months on average. Bluetooth connectivity that is on offer here is innovative. If you are not familiar with Bluetooth, it is a wireless technology that shares data between 2 computing products. In this instance, the brush and your Android or iOS smartphone or tablet. The app has a tendency to distract distracted from actually cleaning the teeth properly. We felt the need to hold the phone and clean my teeth whilst reading the tips when normally, a quick glance at the SmartGuide is much easier and less distracting. If you are distracted there is no way you are going to get the right technique going on. Yes you will clean the teeth, but not properly. It is by not properly doing something that in time problems can arise. No they do not. 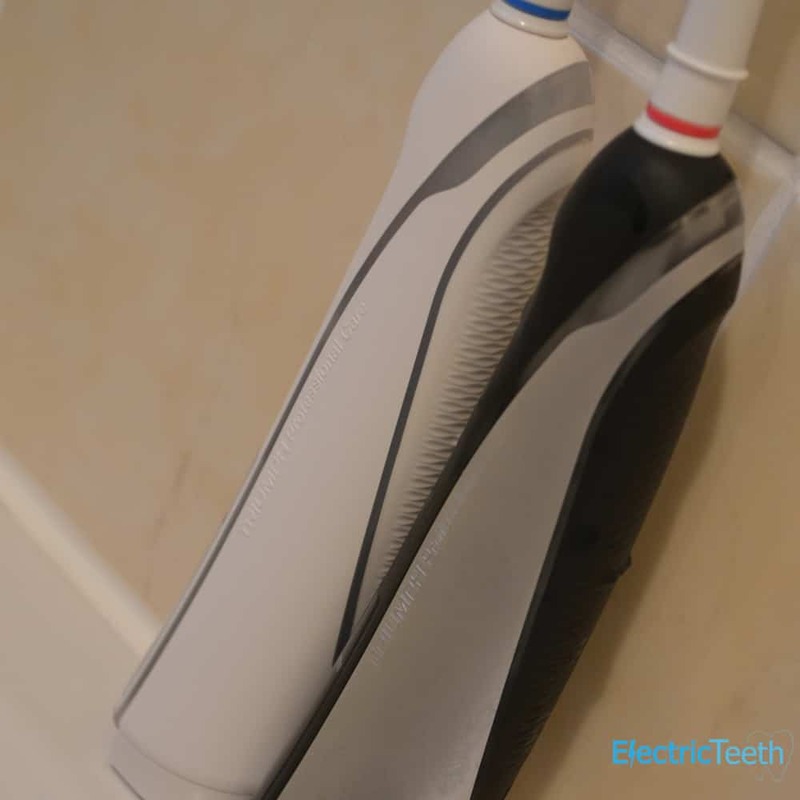 An electric toothbrush will ensure a more regular and balanced clean across the teeth and mouth than manual brushing might, but it still relies on the user placing the brush in the mouth in all the right places to clean effectively. Either of these will serve those with even the most complicated or oral health issues with various cleaning modes and optional brush heads. The reliance on the human hand moving the brush does mean that for the best effect we should train ourselves in using the right technique. Yes. Most of the time, even with an offer on the Pro 6000 will be around £20-25 cheaper, if not a lot more. At the time of writing the Pro 6000 is available from £105* and the Pro 6500 £125*, although £249 a lot of the time.. The Pro 6000 works out at 10p per day over 3 years for one user whilst the 6500 will be a massive 26p if purchased at full price, but 11p at the discounted rate. The advanced features, brush head storage and extended battery life make either of these ideal for a family environment, where the quoted price will only decrease with more users. At the time of concluding the Pro 6000 has topped many of our lists, including the best electric toothbrush money can buy and the best Oral-B electric toothbrush. Unless something newer, cheaper and more impressive comes out, this is unlikely to change. The concept and thought process behind the Pro 6500 is right and as a fan of all things black, initially it has that wow factor, but the premium price tag does not justify the exclusivity of the additional tongue cleaning mode and the weakness in executing the premium colour finish. For little or no extra cost the Pro 6500 could be better than it is. Technically great but aesthetically not so and being honest, that is the primary reason for buying this brush. Thanks for clearing this debate up! No problem Lisa, glad I could help.